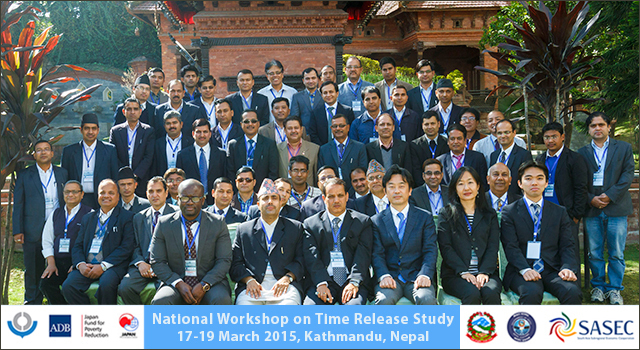 The Nepal Department of Customs (DOC), in partnership with the Asian Development Bank (ADB), World Customs Organization (WCO), and Japan Ministry of Finance, organized the first National Workshop on Time Release Study (TRS) on 17-19 March 2015 in Kathmandu, Nepal. The workshop included a half-day technical training for Customs officials on the use of TRS software developed by the WCO. Approximately 50 participants representing government agencies, private sector organizations and a non-profit organization participated. TRS was one of the six themes for capacity building identified by ADB and the WCO during a planning retreat held in Bangkok, Thailand in January 2013. The WCO TRS is a tool and method for measuring the performance of Customs activities as they relate to trade facilitation at the border. It evaluates Customs performance, assessing effectiveness of border clearance processes by examining the time it takes between the arrival of goods and their release. Other themes identified in the planning include the provisions of the General Annex of the Revised Kyoto Convention, the SAFE Framework of Standards to Secure and Facilitate Global Trade, authorized economic operators, risk management, and post clearance audit. Developing DOC capacity to conduct the TRS at regular intervals. Prior to the workshop, a team comprising DOC officials from Kathmandu and border stations, WCO resource persons, and ADB representatives visited the Birgunj Customs Office to observe the entire process of Customs clearance in order to develop a survey modality of TRS for Nepal Customs. The survey modality was presented at the workshop for discussion. Development of a TRS implementation action plan. The first TRS is expected to be carried out in two Customs offices—Birgunj and Mechi—by a core group of Customs officials to be led by DOC under WCO guidance. The exercise is expected to produce a TRS report in December 2015, based on data collection and analysis to be conducted at these two locations. The TRS is a key activity identified in Nepal’s Customs Reform and Modernization Strategies and Action Plan 2013-2017, as well as the ADB technical assistance grant, Supporting Nepal’s Participation in SASEC Trade Facilitation, funded by the Japan Fund for Poverty Reduction. The TRS will serve as a benchmark of Customs clearance processes and will also form part of the Trade and Transport Facilitation Monitoring Mechanism to be carried out by UNESCAP with ADB assistance.